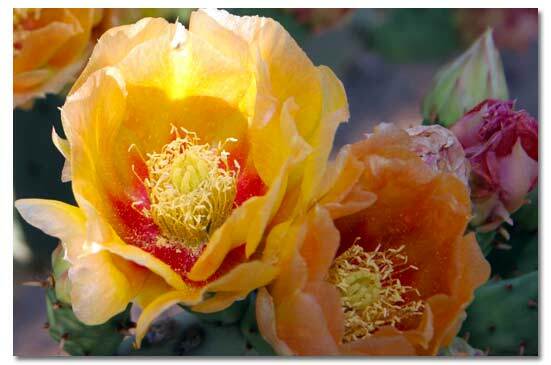 Most prickly pear cactus have yellow, red or purple flowers, even among the same species. They vary in height from less than a foot (plains, hedgehog, tuberous) to 6 or 7 feet (Texas, Santa Rita, pancake). Pads can vary in width, length, shape and color. The beavertail, Santa Rita and blind pear are regarded as spineless, but all have glochids. Prickly pear cactus represent about a dozen species of the Opuntia genus (Family Cactaceae) in the North American deserts. All have flat, fleshy pads that look like large leaves. The pads are actually modified branches or stems that serve several functions -- water storage, photosynthesis and flower production. Chollas are also members of the Opuntia genus but have cylindrical, jointed stems rather than flat pads. 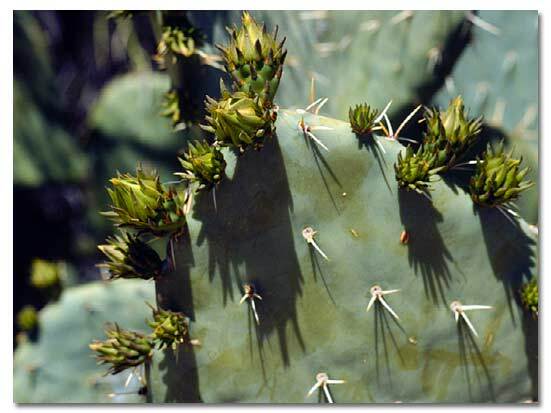 Like other cactus, most prickly pears and chollas have large spines -- actually modified leaves -- growing from tubercles -- small, wart-like projections -- on their stems. But members of the Opuntia genus are unique because of their clusters of fine, tiny, barbed spines called glochids. Found just above the cluster of regular spines, glochids are yellow or red in color and detach easily from the pads. Glochids are often difficult to see and more difficult to remove, once lodged in the skin. Tiny, barbed spines called glochids. 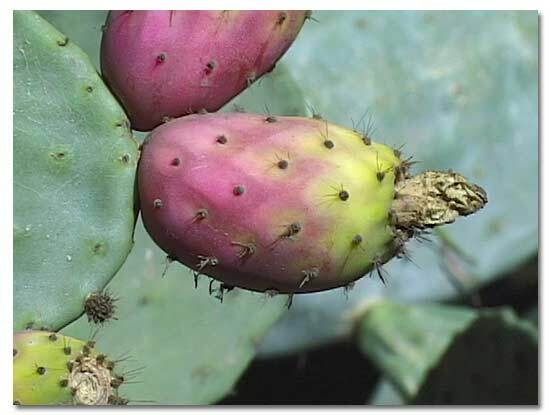 The fruits of most prickly pears are edible and sold in stores under the name "tuna." Prickly pear branches (the pads) are also cooked and eaten as a vegetable. They, too, are sold in stores under the name "Nopalito." 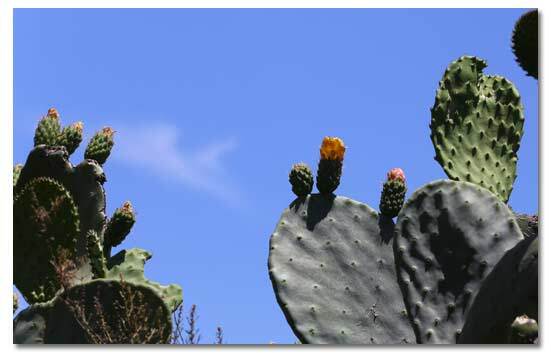 Because of the glochids, great care is required when harvesting or preparing prickly pear cactus. Both the fruits and the pads of the prickly pear cactus are rich in slowly absorbed soluble fibers that may help keep blood sugar stable. 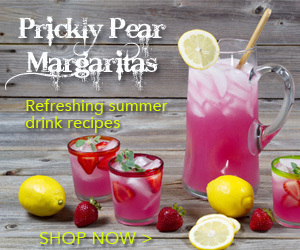 Prickly pear nectar is made with the juice and the pulp of the fruits and is available from our online store. Prickly pear cactus are found in all of the deserts of the American Southwest, with different species having adapted to different locale and elevation ranges. Most require coarse, well-drained soil in dry, rocky flats or slopes. But some prefer mountain pinyon/juniper forests, while others require steep, rocky slopes in mountain foothills. What is that white stuff on my cactus? Cochineal (an insect) is present in much of the lower elevations in the western United States and Mexico. It feeds almost solely on the pads of selected prickly pear cacti species. To find out more information and pictures of cochineal click here. In addition to the North American native prickly pear cactus listed below, there are many varieties, non-native imports and hybrids, so identification can often be difficult. Information on the 15 species listed below is based on wild, non-cultivated samples. Flowers: Reddish-orange to yellow, 2.5 inches.